I’ve realised that I tend to write when something is finished and there hasn’t been a lot of finishing happening around here recently. I was busy at work during January, working an extra half day with a staff member on holidays. 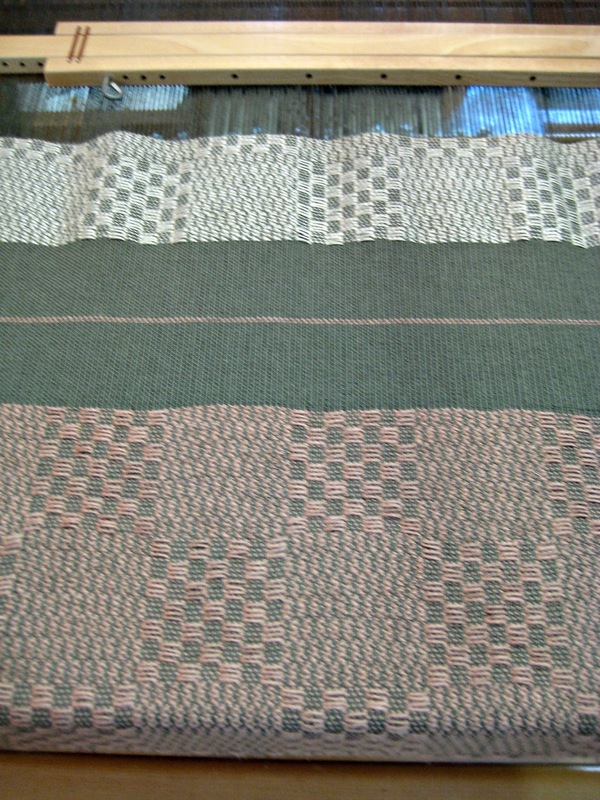 It doesn’t seem much but sure eats into the weaving time, especially when there are long, and not very exciting warps on both looms. Fortunately we had a holiday for Australia Day on the 26th and I was able to make an extra long weekend of it. 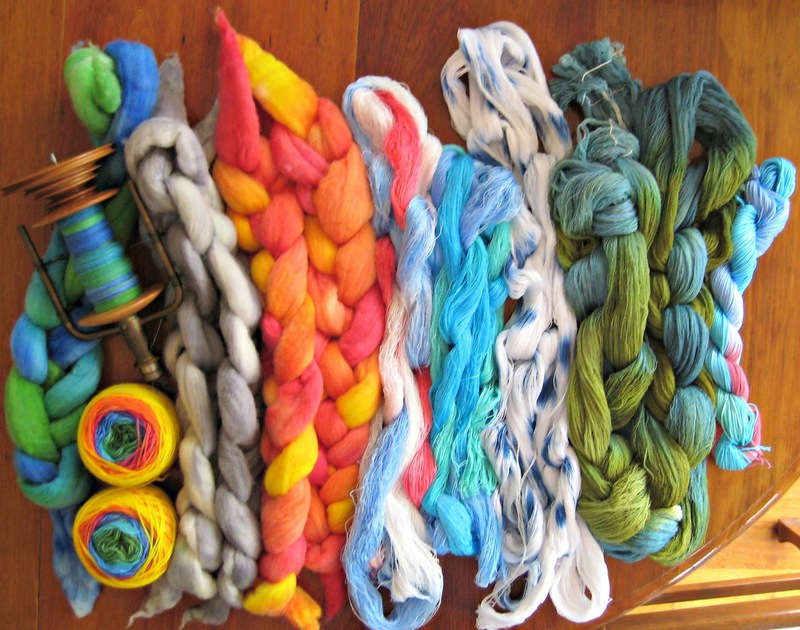 I wanted to do some dyeing and with four days, knew I would have enough time to wind warps, set up, do the dyeing and put it all away again. I wound some warps for dyeing and painting, got some wool top ready to dye and knitted a blank from some 3 ply I’d found in a bargain bag from Bendigo Woollen Mills. I’d planned to dye on Monday but all the prep took longer than expected. It made good sense to get the newspaper and plastic wrap all in place on Monday night and, after attending an Australia Day breakfast, come home and do the dyeing. and a part of the wooden floor which is due to be refinished. 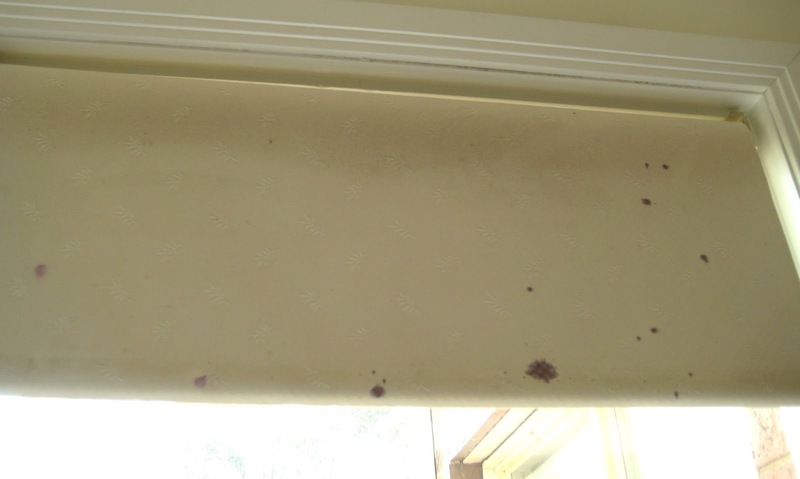 The blind needs to be taken down, dismantled and soaked and if that doesn’t work, I think there is enough fabric in the cupboard to make another. If that fails I may have to add a few carefully arranged artificial flowers to cover the stains. When you think about it, it’s probably not surprising that it cleaned up so well since soaking in soda ash and heating are what sets the dyes on cellulose fibres and none of those conditions was operating when the dye hit. By the time I cleaned up it was quite late but I had a shower to get rid of any remaining dye as I wanted to be sure it had all gone, and my hair wasn’t pink before I went out next morning. As I stood under the shower, late at night, little pink trickles kept running down my skin. I was much more careful doing the dyeing after that and I won’t forget this lesson. 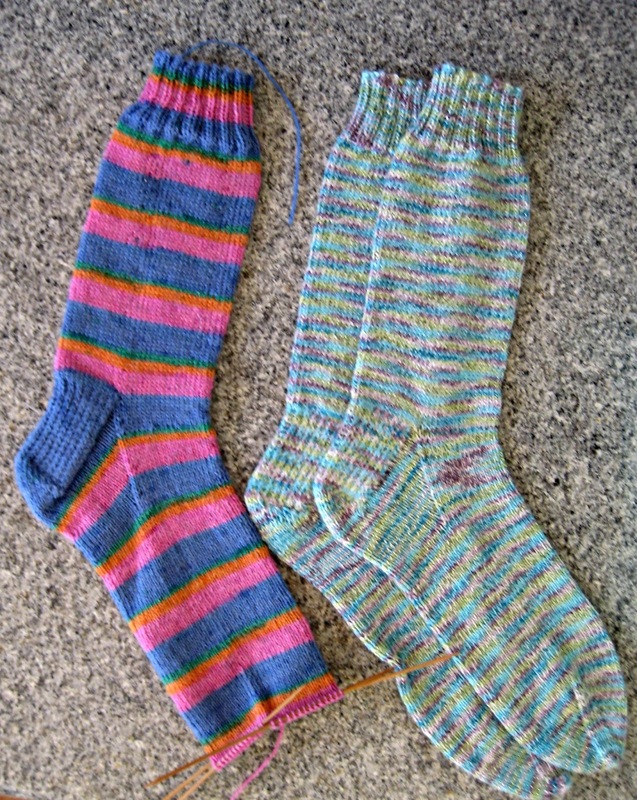 During January I did manage to knit some socks. I have knitted them in the past but was not that excited with the result and decided to try again. 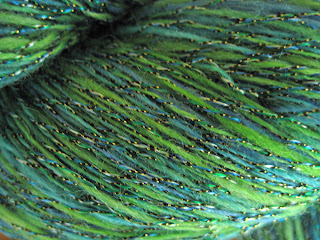 I had bought some Tofutsies yarn with the idea of weaving with it but I realised that the very short colour repeats would not work for weaving. I could hear a little voice saying ‘knit me, knit me’ and of course the obvious thing was to knit some socks. 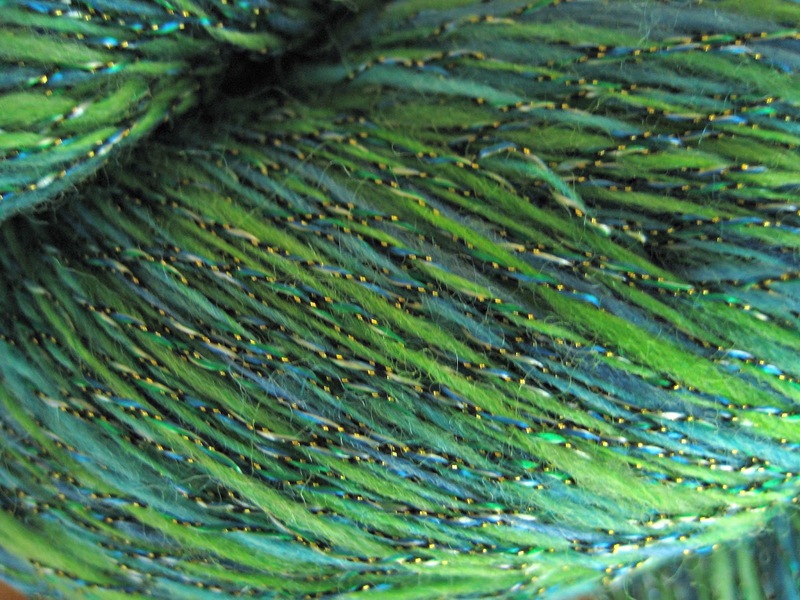 It was a good blend – 50% wool, 22.5% cotton, 25% soysilk and 2.5% chitin(from shrimp and crab shells) – to knit during the hot weather. One pair finished and another sock almost finished. I even realised that there wasn’t a rule to say that it was compulsory to knit the yarn as it came off the ball if cutting and re-joining would make the stripe pattern work better. 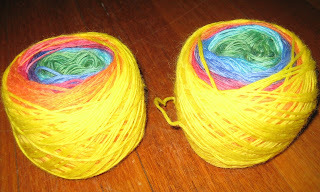 I’m happy with the first one of this pair and there’s been no sign of the yarn or sock police so far. I just have to make sure the stripes match on the second one of this pair and then it’s on to the dyed blank where everything should match perfectly. Think they will be toe up with yellow toes. I’ve also been working on spindle spinning, I think I’ve got the hang of it and I like the portability but I don’t think I’ll be getting rid of any of my wheels for a while yet. 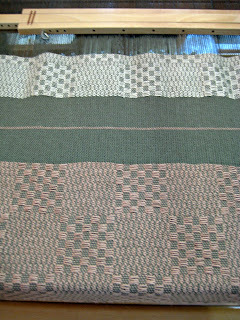 On the weaving front, the tea towels are still in progress but need to be done for a market on the first Sunday in March. I’ve done one in natural, one in lemon, one in a textured gold yarn, one in a light salmon cottolin and have just started one in natural linen. It’s the first time I’ve used linen but seems to be behaving well so far. I think this is probably number 9 of 13 or 14, I seem to be losing count.